Hey, everyone! It’s our Deals Week, where we give you a solid seven days of awesome deals on plenty of items so you don’t have to wait for Black Friday ! And the first of our deal items is the Black Titan SV Solid! 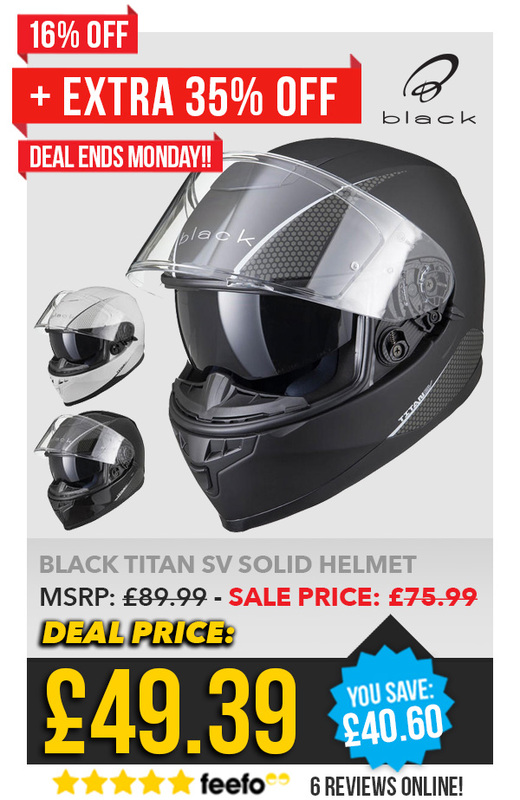 The Titan SV was already a brilliant, affordable motorcycle helmet before our Deals Week price. A polycarbonate shell, great for impact protection with comfortable padding so that you can focus on the road. A drop-down internal sun visor keeps you from getting dazzled by the sun and a MaxVision visor with the Pinlock MaxVision insert gives you the best, fog free field of view. This lid is a commuter’s best mate, even more so at our deal price of £49.39 down from £75.99.